hspsblog | Ideas and Resources for HSPs…..
i wanted to share a very interesting article about what to expect if a person is in a relationship with a Highly Sensitive Person. It is refreshing to see multiple new articles on Highly Sensitive People that have recently been written on the Huffington Post website. While you are there run a search for HSP and you will be delighted to find other recent articles on HSPs. Enjoy and wishing you a productive week! After reading this weeks email installment from Cheryl Richardson, I had an Aha! Moment…I also feel contentment after returning from my regular ‘Nature Runs’. It is so very invigorating running outside amongst the beautiful summer landscape, and listening to the symphony of birds singing along the trail and overhead! Please head over to Cheryl’s Site and enjoy this truly inspirational article and see if it also rings true for you too! Please post your thoughts. If you enjoy the Article, consider subscribing to her weekly email for inspiration! Cheryl has also written that she is also a Highly Sensitive Person and has provided many ideas and suggestions for HSPs in her Books and on her Website. When is the last time that you took time out of your day for awareness? I am referring to the concept of living in the moment and being aware of ourselves the world around us. Living in the moment and enjoying the moment frees us from worrying about our past or future. It allows us to accomplish greatness, as each and every day can be looked at as a renewal of our current potential. However, being highly sensitive creates an amplification, in my opinion, of our feelings and emotions in regards to our past and future experiences that can sometimes overwhelm us. By focusing on the here and now we can minimize the ‘interruptions’ that can sidetrack us from our current growth and accomplishments for today. Which brings us back to Yoga, which I have found helps me to live in the moment and has allows for more awareness and grounding in the current moment. Kara-Leah Grant, whose website, The Yoga Lunchbox, offers a brilliant article on the importance of Awareness in Yoga. Duncan Peak at compression in his forward bend. From The Yoga Lunchbox Website article. ‘Yes, the range of motion in a backbend is determined by our muscles. But it’s also determined by the physical limitations of the vertebral arches, the anterior longitudinal ligament (this runs down the inside of the spine), the disks and the superior and inferior articular processes (boney protrusions of the vertebra). We can learn from this article that awareness really does allow us to be open to change, both physically and mentally. Please let me know your comments! I am back after a long hiatus from blogging with a new and fresh HSP perspective for your consideration. Sometimes a New Perspective is all it takes to jump-start your creativity and happiness! The world looks different when you are in a handstand/headstand; to me Yoga is looking at the world from a fresh perspective. It is so important to look at the world from a new perspective every day as an HSP and not to get caught up in ‘ruts’ along the way. This freshness brings new meaning to daily life and daily Yoga practice, as well, as repetitive motions, that had previously become ‘dusty’, ‘rusty’, boring and ancient, can now be looked at from a new perspective. Today’s practice can be more enjoyable than yesterday, and so can the rest of your day, just based on your new found ‘fresh’ perspective. Please, take this fresh perspective with you in all that you do during the rest of your day. Every day can be full of excitement and vigor, as long as our perspectives are new. Take note of the various Yoga forms (asanas) in our daily practices and sense how they feel and from what perspective you are looking at the room from; you may be surprised that these differing perspectives help you look at things in ways you had never thought of. Another Note: Yoga starts with the Letter Y that looks like a person standing upside-down; now that’s a new concept. Please sound off with comments, as I would be very interested in hearing your perspectives on this topic, as well. If you might also be interested in trying out yoga, below is a link to what I have found to be a very helpful Ashtanga (Power) Yoga APP that is reasonably priced and has vocal prompts, as well as visual instructions. This APP is from Michael Gannon, who I have found to be an inspiring instructor and this APP provides an opportunity to learn from an instructor that (in my opinion) provides yoga instruction with clear examples. Please consult a doctor before trying any of the examples, and also, it is recommended to find an instructor, to make sure that you are forms/postures are good or in need of correction. Well is it really possible to provide the Elixir of happiness on my Blog? I ran across a very uplifting book, which is colorful, meaningful and does suggest an idea for long lasting happiness. And for a short amount of time the Kindle Ebook is Free…Why not cozy up and download this charming and very meaningful Children’s book by the author, Suzy Liebermann. Over the last few months many of her books have been available free of charge, as one day promotions. Going against the grain of selfishness and lack of empathy for others, Hugo The Starfish’s friends encourage this cute character to share his love with others and that this is the way to lasting Happiness. 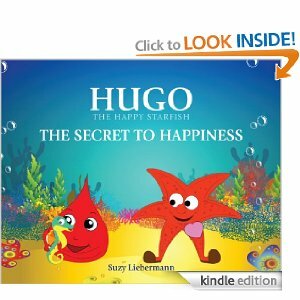 Here is a link to the free version of ‘The Secret to Happiness’ with Hugo The Starfish, and currently this book has 27 reviews with a rating of 4.7! on Amazon. Wow! Please help yourself to some happiness! I just read a wonderful article from the INC Website and was very inspired by the topic and felt that this information might also be helpful to our readers, as a Positive Attitude is not always a given and many of us struggle to have a baseline Positive Attitude with all of the outside ‘noises’ in our lives. It is easy to get into a rut of negativity as an HSP and quite difficult to get ‘unstuck’ and back to Positivity. Here is the article in its entirety from the INC. Website . Please feel free to post comments on this blog regarding this or any of the other posts on this Blog. Sending you wishes for successes in developing your Positive Attitude and letting go of the ‘thoughts’ and ‘feelings’ that can pull us down from our pinnacle of happiness and positivity! Our world around is moving in Fast-Forward. There are so many HSP stressors around us, whether it is the traffic, news, loud music, our jobs, money worries, and family challenges, just to name a few. I have found a novel, unique way to transport myself via a ‘time machine’ into the past and have found much solace and comfort. Wouldn’t it be nice to take some time away from our daily stress routines to live in a time where there was no media, gadgets, loud noises, traffic and ‘task-stacking’ to rob us of quality time? There are wonderful recordings available of music from the late 1800’s and early 1900’s and I have found that this music contains an abundance of happiness and a good measure of care-free joy. Please give this music a try and close your eyes and imagine that you are living during the late 1800’s without pagers, mobile phones, traffic or other distractions. If you are a musician, as I am, playing this music on a period instrument adds to the experience! Please give this idea a ‘spin around the block’ and please let me know if you also find this idea helpful to your stress too. Wishing you a happy journey into the past! In a recent article, True Secret to Success (It’s Not What You Think) from the INC. Website, author Geoffrey James shows the importance of gratitude in the pursuit of Happiness and Success. The premise of his article is that if you want to be successful, this is commensurate with the amount of gratitude in your life. Also highlighted are his recommendations for ‘mining’ gratitude, as he visualizes gratitude as a muscle and that we need to exercise this muscle to attain success. I highly enjoyed this article and look forward to flexing my newly found muscle! Again…for those who missed this important HSP Resources Post! These books are also available from Amazon and other vendors. Please comment if you have read any of these and post your recommendations or ideas.